If you asked me two years ago what a pangolin is, I wouldn’t be able to answer that question. And when I tell people that a visit to a pangolin rescue centre is one of the highlights of my Future For Nature Academy Report journey, they often end up clueless. A what? What is a pangolin? I think it is a shame that the pangolin is still so unknown to the general public, especially when you consider its current conservation status. That’s why this blogpost is dedicated to this interesting creature. Even after having spend two weeks in a rescue centre with pangolins, they amaze me every single moment. But why exactly? Time for some pangolin 101! I’ll start with stating the obvious: a pangolin is an odd-looking animal. At a first glance, you might think you are looking at a reptile, but it actually is a mammal. The only mammal with scales to be more precise. 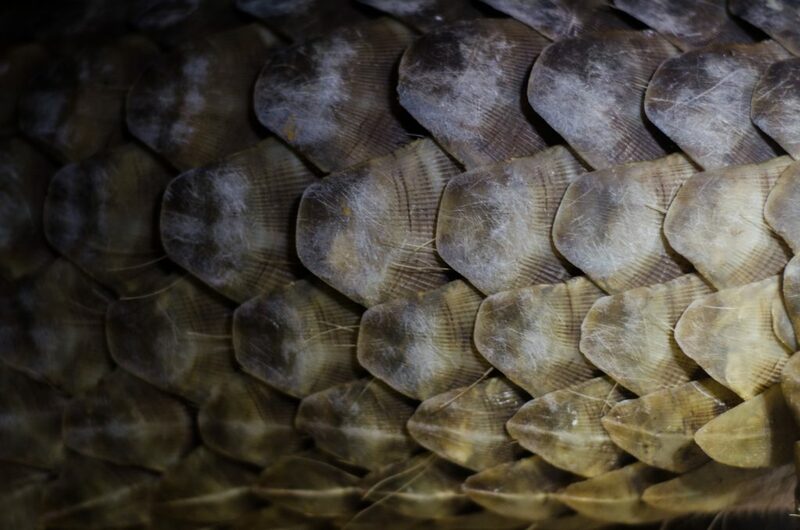 That’s right, the most striking feature of a pangolin is its back, which is fully covered in keratin scales. This armour protects the animal against predators. If a pangolin is attacked, it rolls up into a scaly ball, escaping the teeth and claws of its predators. There are currently 8 species (4 in Africa, 4 in Asia) of pangolins known, all within the same family, Manidae. This family is the only one within the order Pholidota. Although its appearance might suggest that pangolins are closely related to armadillos and anteaters, in fact the order of Pholidota is closer related to the order Carnivora. This means that pangolins are more related to bears and tigers than to armadillos and anteaters! 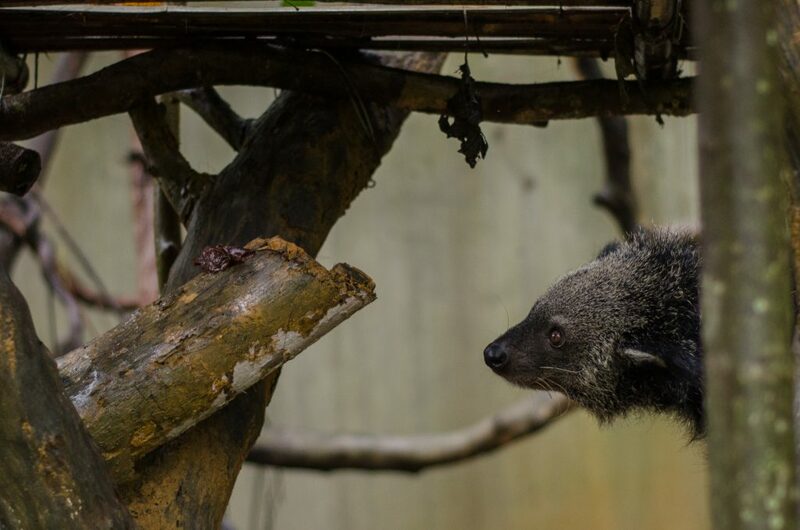 The African species are listed as ‘vulnerable’, according to the IUCN red list, but their Asian cousins are all endangered, with the Chinese and the Sunda pangolin being critically endangered. And as if that’s not enough, their numbers are rapidly decreasing. What is happening here?! Well, the pangolin has the questionable honour of being the most wanted animal among poachers. 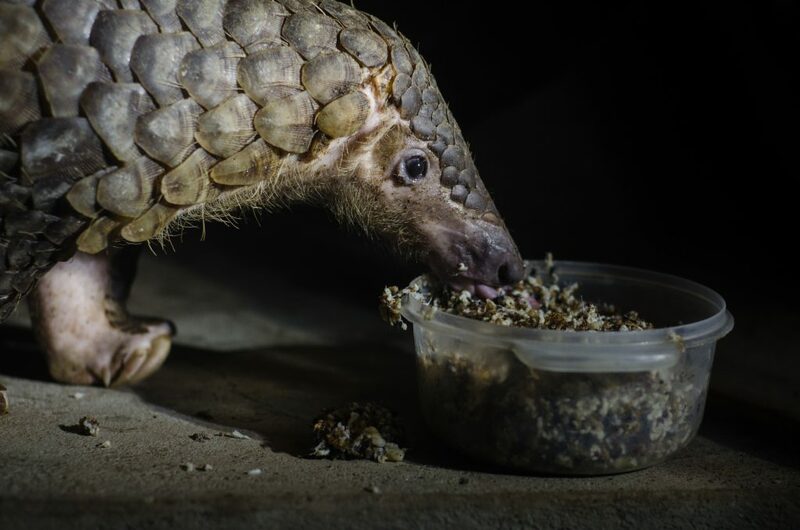 There is high demand for almost every part of the pangolin, making it a very lucrative business for poachers and wildlife traffickers. Its meat is considered a delicacy and it is believed that its blood and scales can treat a variety of health conditions and are therefore wanted for traditional medicines. I guess it’s needless to say that there is no scientific proof whatsoever for the benefits of those ‘medicines’. Ironically, it is the defence mechanism of the pangolin that makes it an easy victim. Rolling up and turning into a heavy-armoured ball might work well against natural predators like tigers and clouded leopards, but there is one predator that doesn’t care about this at all: the human. Poachers simply pick up the pangolin when it’s rolled up and put it into a net. Furthermore, traps are commonly used too, to catch the pangolins. As a result, about hundreds of thousands of pangolins are taken out of the wild every year, despite a total ban on pangolin trade. An analysis published last year in Conservation Letters, estimated the scale of the pangolin trade in Africa and the results are shocking. The analysis showed that up to 2.7 million African pangolins are killed each year, with the most conservative estimation being a staggering 400.000 pangolins a year. Fortunately, the interest in this incredible animal and its fate has rapidly increased over the past time, with large wildlife channels as National Geographic and BBC Earth shining their lights on this issue. Awareness is the first – and a very crucial – step in the protection of a species, but it doesn’t stop there. Obviously, you need conservation action as well. 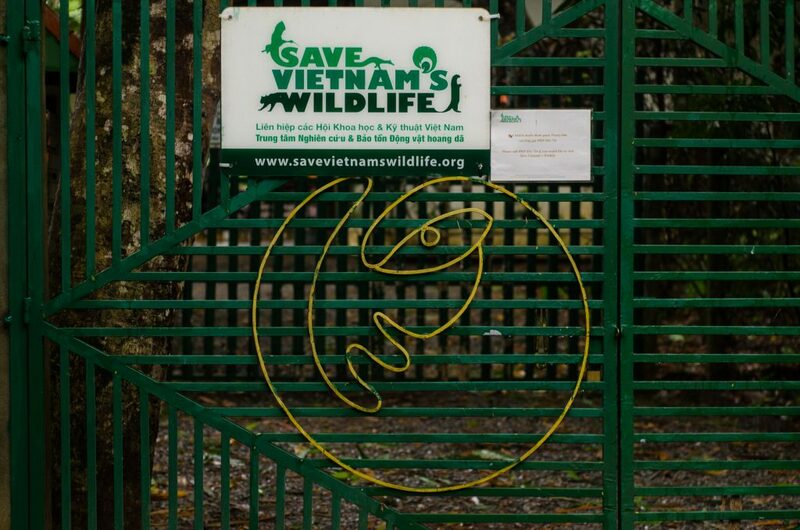 Entering Save Vietnam’s Wildlife (SVW). Founded by 2016 Future For Nature Award Winner Thai Van Nguyen, SVW is a young NGO on a mission to prevent the extinction and champion the recovery of threatened species in Vietnam. They do so through an integrated approach, combining research, advocacy, education, site protection and wildlife rescue. The latter is probably what SVW is most famous for. Therefore, the next weeks, I will focus on the work in the rescue centre. SVW works together with the Vietnamese government to rescue trafficked pangolins. Every time rangers come across wildlife trafficking, the Rapid Response Team of SVW will be informed. The team is stand-by 24/7 and within no-time they are able to reach the confiscation site. At first, they make sure the animals receive the medical first-aid they need. Often, pangolins are injured during the trafficking process and the team makes sure those injuries are treated. In the meantime, paperwork is being done and when they do have the permission, SVW transports the confiscated pangolins to their rescue centre, which is located at the edge of Cuc Phuong National Park, in the north of Vietnam. In the centre, the animals receive the care they need in order to be released back into the wild. This usually happens after about a month after confiscation. 99% of the confiscated pangolins are Sunda pangolins, with an occasional Chinese pangolin being brought into the centre. This comes as no surprise, as these two species are the only ones occurring on the mainland of South-East Asia. The rescue centre is located outside of the natural range of both of thespecies, but a lot of the poached pangolins are being transported to (North) Vietnam and China, where demand for pangolin products is the highest. Being close to these trading hotspots makes it easier to transport rescued animals to the centre. Of course, when healthy and fit again, the pangolins are transported to their natural range, where they are released. Next week I will take you to the rescue centre to show you what’s going on over there. Furthermore, I will introduce you to some other inhabitants of the rescue centre. Finally, if you want to learn more about SVW and their work, have a look at their website.